Said to Congress by the 88-year-old in a grave tone one would think it to be an honest admission. That however, is hardly the case. Let me explain what a ‘market participant’ actually is. A ‘market participant’ is someone who is involved in what is generally referred to as the stock market (Dow, S&P) or the bond market. The people who are professional ‘market participants’ carry the lay title Banker. So what Mr. Greenspan is saying to Congress is that he was unexpectedly surprised to discover that banker’s greed exceeds their rational thought, to which I say, Mr. Greenspan, have you ever met a banker? 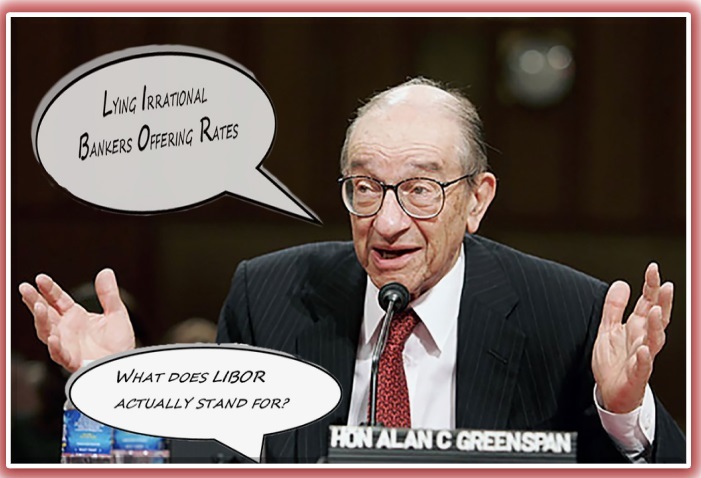 One current example, of the multitude available, is the manipulation of LIBOR. Overnight, large banks borrow from one another. The interest they pay on these overnight loans is called LIBOR (London Interbank Offered Rate). Just like when you take out a loan to buy a car, if your credit is bad you get a high interest rate because your credit score is a reflection of the probability you may default (or not pay your loan back on time). Banks borrow massive sums of money so this interest rate needs to be low or it will cut into profits. However, in 2007, with the looming financial crisis, banks weren’t getting their previously low interest rate (a reflection of their poor financial health) but if they borrowed money and news got out that they had a high interest rate, investors would sell their stock and the price would plummet. So, Mr. Greenspan’s ‘rational market participants’ did the following. Unbelievably, until very recently, London regulators who set the interest rate (LIBOR) trusted banks to give them accurate numbers as to the interest they must pay. As is always the case, bankers with no oversight have very little reason to comply with any sense of integrity and accordingly lied about the interest rate they were paying for the overnight loans to prevent investors from finding out their banks were no longer worth the price of their stock. That seems pretty bad, but it doesn’t hint at how irrational these actions were. LIBOR effectively sets interest rates for every loan of every kind from student loans to mortgages in 10 different currencies. This means, the bankers created legal liability to every person with any type of debt, which amounts to over $10 trillion in addition to countless trillions in derivatives. Going back to Mr. Greenspan, he knows perfectly well never to trust a banker. The ‘market participant’ to whom he is referring is himself! Leading up to the financial crisis he was revered as the best Fed Chair in history. However, even nerdy economists can become egotistical, so he threw caution to the wind and with it regulatory oversight and duly earned his new reputation as the Fed Chair who destroyed the global economy. Did I miss something? Did Mr Greenspan repeal the Glass Steagal act (regulatory oversight) or was that Congress? Yes, you did miss something. Glass-Steagall separated investment banks from commercial banks because the government (FDIC) insures up to $500,000 of an individual’s bank deposits. Striking down Glass-Steagall allowed the funds of investment to be co-mingled with those of depositors, leaving the government on the line for insuring both. The Federal Reserve System regulates financial institutions and their associated activities and ensures fair and equitable services to customers to maintain financial stability of the system. Not regulating instruments with such undeterminable risk such as CDO’s is a failure in this respect because the system needed tremendous taxpayer support to offset the losses incurred as CDO’s went bad and put strain on the financial markets.